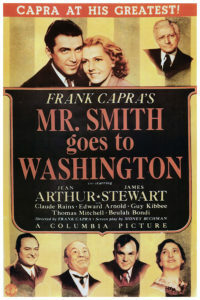 Mr. Smith Goes to Washington is a classic movie about American government and politics. At the opening of the movie, a U.S. Senator dies. His replacement is a naive examplar of a citizen from the midwest, Jeff Smith. 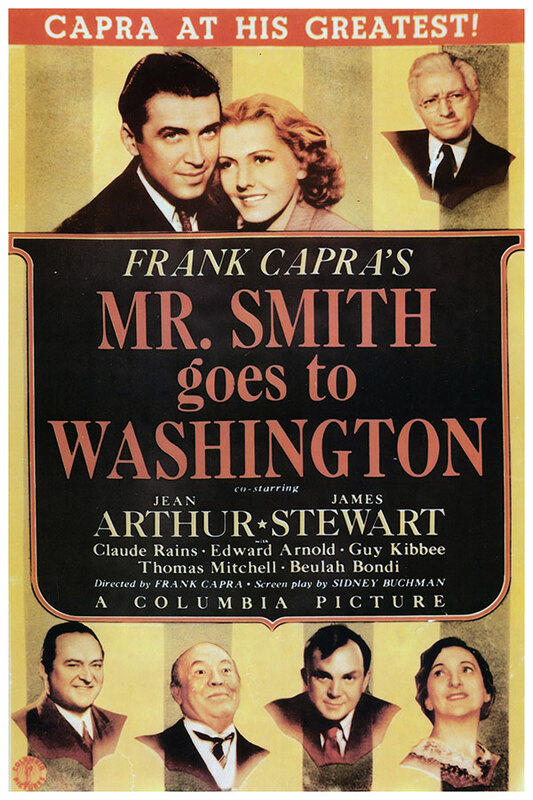 When Mr. Smith gets to Washington, he realizes that things aren’t quite as rosy and perfect as he thought, and he comes face to face with corruption in the United States government. This movie is old, but it is still extremely relevant. Despite being in black and white, I’ve found that my students still enjoy it. It is an excellent way to illustrate both the mechanics of government and the ways in which the reality of government diverges from the ideal. If you’ve never seen the movie, here’s a quick plot summary. If you have, you may want to just jump down to the next section about the ways in which this is a great tool for teaching civics. As the movie opens, Senator Sam Foley dies. The Governor of his state, Hubert “Happy” Hopper, must appoint a successor. In the opening scenes, Hopper gets an earful from his constituents and lobbyists, and he has to deal with the press. Behind the scenes, he is advised by a seemingly corrupt political boss, Jim Taylor. Ultimately, they land on Jefferson Smith – a Boy Scout leader and a naive, model citizen – as a replacement. Jim Taylor is plotting to make a lot of money through a real estate scheme, and he needs a Senator that won’t ask too many questions about what’s going on. Jeff Smith can quote all of the founding fathers, and for better or worse he believes in the mythology of America. When he first arrives in Washington, he takes off on a tour of the city to take in all of the patriotic sights and sounds. Eventually, he comes back to his office and begins to ask questions about the business of the Senate. In order to distract Smith, Paine suggests that he work on a bill of his own. His secretary gives him a depressing explanation of the legislative process, but Jeff goes through with drafting a bill to create a national boys camp. As it turns out, Jeff’s boys camp is to be built on the same piece of land that Jim Taylor has been planning to sell to the government. Jeff Smith starts digging around and threatens to uncover the whole plot, so Taylor decides to point the finger at Smith and frame him for the whole corrupt idea. There is a great deal of political drama as the Senate considers whether or not to expel Jeff Smith, and he holds the floor in a lengthy filibuster. Does Jeff Smith or Jim Taylor win out? You’ll have to watch the movie to find out. This classic film is useful for both teaching the mechanics of government and for discussing some of the essential questions about civics. 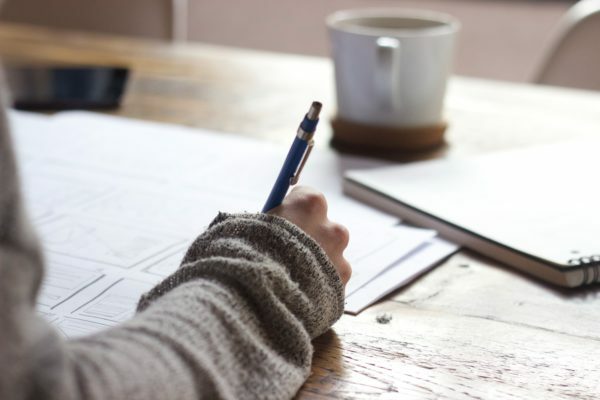 This is by no means an exhaustive list, but here are five ideas worth focusing on while you view the movie with your students. How Does the Filibuster Affect the Legislative Process? 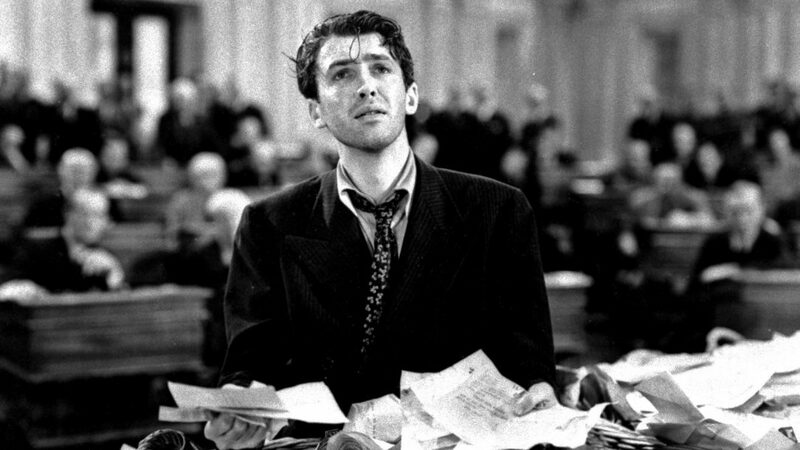 One of the most dramatic parts of the movie is when Jeff Smith takes the floor of the Senate and holds it in a filibuster. This is a great illustration of what a traditional filibuster actually is and how physically demanding it can be. It sounds easy enough to just keep talking, but the reality is that after a few hours it becomes not only tedious but strenuous. This can also be a good opportunity to talk about the ways in which the filibuster has changed in recent years or to take a look at recent examples of filibusters. In the movie Jeff Smith brought an apple for a snack, and you can watch a video of Rand Paul eating a candy bar on the Senate floor halfway through his thirteen hour filibuster. Are Political Bosses a Corrupting Influence on Politics? Jim Taylor provides a foil to Jeff Smith. Jim is as dishonest and evil as Jeff is good and honest. On the one hand, Jim Taylor provides a concrete example of corruption in politics. He’s using his influence to directly profit himself. But underneath the surface is a more subtle question of the extent to which is influence itself is corrupting and bad. This is an opportunity to talk about campaign finance and the relationships between politicians and donors. If Taylor hadn’t been scheming for his own profit, would it have been as wrong for him to advise the Governor on the appointment of a new Senator? One doesn’t have to look far in New Jersey for a businessman who has a very tight relationship with powerful politicians and control of elements of the media. How Does Public Opinion Influence Legislators? The scenes of the young boy rangers printing newspapers and delivering them immediately was probably one of the more over-dramatized and unrealistic parts of the film. But it’s an interesting plot element for talking about the role of the media. Today, you could definitely communicate with lightning speed via social media. What’s going on in Washington is constantly being televised on C-SPAN and beamed across the Internet. And if the cameras are shut off, there’s always Facebook live. How Do Bills Really Become Laws? At one point, Jeff Smith’s secretary gives him an earful about the legislative process. He seems to have just seen the classic “How a Bill Becomes a Law” Schoolhouse Rocks video, and he’s optimistic that his bill will easily pass because it’s a good idea. She deals him a dose of reality and explains the real process. A bill has to jump through all kinds of hurdles and survive any number of delays in order to make it to the end of the process. She gives a pretty accurate, albeit pessimistic, explanation, and this difference between the reality of lawmaking and the ideal nature of the process is good fodder for discussion. You could also watch this Daily Show clip from a few years back. Do Politicians Represent Their Principles, Their People, or Their Parties? There’s also a discussion to be had about who Senators and politicians are elected to represent. When a politician makes a decision, they have to balance a number of priorities – their own principles and beliefs, the desires of their constituents, and the demands of their respective political parties. On the one hand, Jeff Smith seems to be insisting that an honest Senator with integrity would stand up for his principles before anything else. But is it all that bad to make a decision that prioritizes one of the other two? This is a great movie, and you should consider watching it with your class or assigning it as an optional assignment this year. If you’re concerned about wasting class time, here are some creative ways to incorporate movies into your class. And if you’ve never seen it yourself, you should definitely add it to your to do list. Head over to Amazon and pick up a copy. I think it’s also available to stream on Hulu. 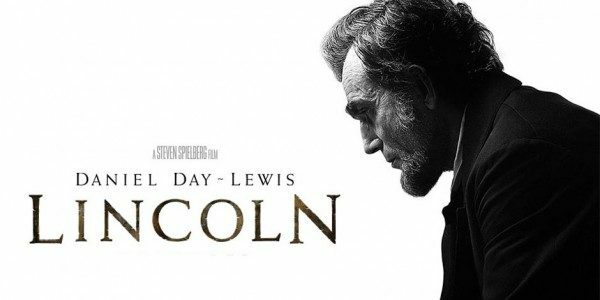 And if you’re looking for another movie that might be interesting, check out this list of 24 great government movies. Next postWhat Is the StudentCam Competition and How Does It Relate to Civics?